This story has been updated to include comments from Bobbie Walton, stock horse team coach. 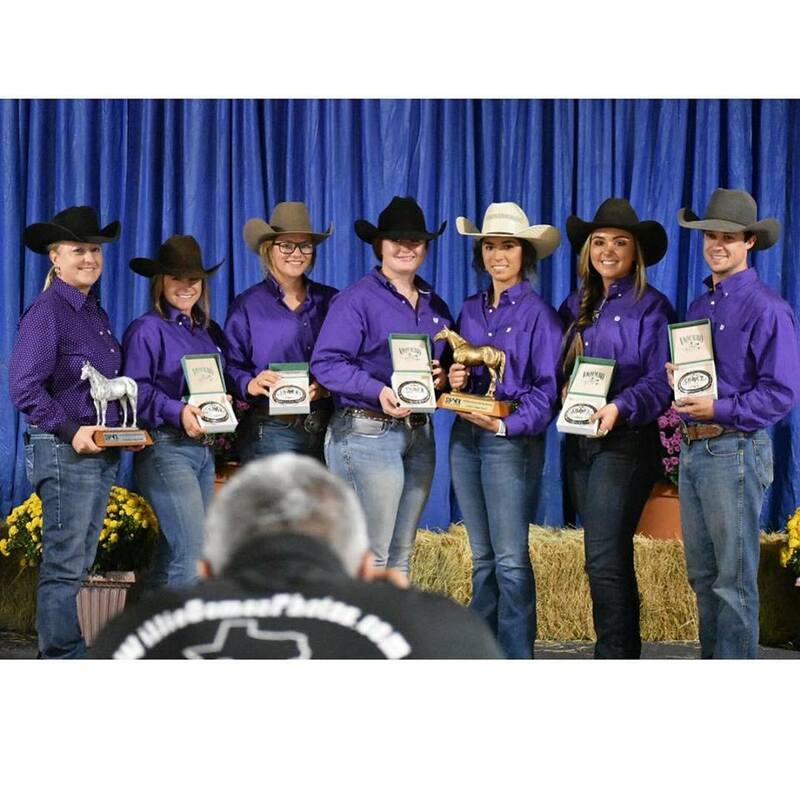 The Tarleton State Stock Horse Team is the D22 Collegiate SHTX World Champions. Photo Courtesy of Tarleton College of Agricultural and Environmental Sciences Facebook. 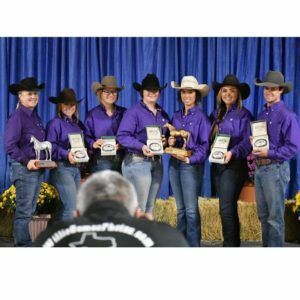 The Tarleton State University Stock Horse team claimed its second straight world title. Audrey Whitehead, Katlyn Humphreys, Shadee Tye, Adam Baxter and Khyman Taylor made up the team that won the Collegiate Division II Category at the SHTX Western Horseman Stock Horse World Show in Abilene, Texas. Coached by Bobbie Walton, director of the Equine Center, the stock horse team competes in ranch reining, ranch riding, ranch trail and a cow-horse working class. “It basically just shows the versatility and the athleticism of the stock horse in four very different separate events. Everything that we do you would do out on a ranch, so another name for it is ranch horse versatility, that kind of explains a little bit more of what we do, but pretty much it’s just showing a horse that’s really versatile that can go out and do any job you would have it to do,” said Whitehead, a senior animal science major that has been on the team for three years. The classes are all designed to show off different areas of horse work. “Your ranch riding (stock horse pleasure) class is kind of looking at transitions; how your horse moves, how willing it is to respond to your cues, in all the events, but especially in ranch horse. It should look to the judge that it’s easy and pleasurable to ride,” said Whitehead. Trail classes showcase the horse’s ability to complete tasks that it might be faced with every day. “The trial mimics things that you would see out on a trail, checking pasture, or out ranching. You open gates, load in trailers, lope over logs, drag logs and things like that so it’s kind of an obstacle course,” Whitehead said. The event that most people would recognize is reigning, a class that goes of a set pattern for each rider. “The ranch reining is like your traditional reigning class, it has the big stop, the fast turnaround, the circle and the lead changes. The equitation (way you handle your horse) and the way the horse looks is a little bit different. You want a horse that can be put in the bridle and be soft. You don’t want this big draped rein. You want a horse that is working and athletic and is willingly guided. That is what it actually says in the rule book, that you want a horse that is willingly guided,” Whitehead said. The final class is a cow working class that most closely resembles cutting horses. This class demonstrates the horse’s ability to do cow work. “The cow working class is a type of offensive cow work, it’s just you and your horse. You signal for one cow to be let out in the arena and then you move it around the arena depending on what division you are in. In the lower division you keep it on one end, in some of the higher divisions you take it down to the other end, turn it on the fence and circle it. You and your horse want to manipulate that cow and where it goes. You get judged on eye appeal position and control, courage and level of difficulty,” said Whitehead. At the contest, Whitehead took third in overall in the Intermediate Division, second in the ranch pleasure event, third in reigning and seventh in working cow horse. “Day one, I won fifth overall. What you do is compete in all four classes and you get points for what you place. The higher you place the more points you get. So we had a class of about 40. The first day I actually won the pleasure. I was second in the cow, mid pack in the reigning and mid pack in the trail. The second day I got fourth overall, so the same thing. You compete in all four classes. I placed first in the reining, fifth in the pleasure, 13th in the cow and mid pack in the trail. The fifth overall and fourth overall are combined for a total of the two days. I was third overall, in a class of 40,” Whitehead said. Humphreys also competed in the Intermediate Division, finishing sixth in the overall standings, first in ranch pleasure and third in working cow horse. “The entire weekend was such a big accomplishment for me and my horse. We have worked so hard to get to where we are today and I thank our team and Ms. Bobbie, our coach, for being there for me and everyone else,” said Humphreys, a senior animal science major who has been on the team for two years. Competing in the Novice Division, Tye finished in 15th place overall and won seventh in working cow horse. “It’s been so rewarding and I’ve learned and grown so much as a horseman. It’s such a great group of people. I’ve rode ranch horses all my life. Both sides of my family come from ranching-related backgrounds. I used to go work with my uncles when they would go work cows some. I currently help my dad without ranch and the cattle we raise on it, but I’m fairly new to the show side of things,” said Tye a sophomore that has been on the team since her freshman year. Being on the stock horse team has meant a lot to both Whitehead and Humphreys. “I have loved every bit of being on the stock horse team for Tarleton. I have shown my entire life and being able to share all the exciting moments and practices with a team is just amazing. The fact we get to learn from each other and build from one another is a great experience and has tremendously helped me as a horse woman,” said Humphreys. Whitehead shared her sentiment and added how much winning back-to-back world titles means to her. “I am so honored to be part of a team that is so passionate and dedicated to growing as horsemen. We’ve worked so hard over the past few years to build this team back up. It kind of got lost in the shuffle of things. Winning two back-to-back world titles is just awesome. We worked really hard, our advisor and coach, Bobbie Walton is just absolutely fabulous, she is such a good teacher and instructor and continues to encourage us and helps us grow our horsemanship. It means a lot to all of us to win two back-to-back titles. It’s great for the team and it’s what we have been working for the last few years,” Whitehead said. Walton also believed that the team has worked hard over the past two years. “Myself along with my husband Allen have been helping coach the stock horse team for 2 years. It feels great to win back to back championships. I’m proud of the students for their accomplishments and how they worked together. I have enjoyed seeing these students grow and improve in their horsemanship skills and as people. They are becoming more confident and consistent in their riding which showed in how they have performed. They are friendly, enthusiastic, helpful and dedicated individuals who support each other and represent Tarleton State University well,” she said. The contest is divided up into different divisions based on skill level: Novice, Intermediate Non Pro, Limited Non Pro, Non Pro and Open. “The reason that they are divided is to set people up for success so that you can compete against people that are the same skill level that you are. When you buckle, when you win a show, or a year-end deal or a world title in that division you are automatically booted out and you have to go to the next division. Mainly the cow work changes. Nothing really changes in those classes except the level of difficulty in the cow work changes,” said Whitehead. Novice is the lowest level for collegiate riders. “The novice is like your beginner people that haven’t won any money in the Stock Horse of Texas Association. It does not matter the age of the horse, anyone over 18 can show in the novice. The novice is actually pretty tough. The novice class is one of the hardest to place out of. It is the biggest class. There are about 60 people in it and it’s a super tough go of it every show,” said Whitehead. The next level is Intermediate Non Pro followed by the Limited Non Pro and the junior horse. In these divisions the cow work is different. “In the novice you just box it (the cow) in and hold it. In the Intermediate, the junior and the Limited Non Pro, you box it on one end, drive the calf to the other end, box it or hold it on the other end and then drive it back to the original end, so the cow work differs a little bit from the novice to the upper levels. The Limited Non Pro are the people that are right in the middle of the Novice and the No-Pro. They are starting to get on the fence with the cow and it’s a tough class too. Lots and lots of good horses in the Limited Non Pro close,” said Whitehead. The junior horse division is not based on rider but on the horse’s age. “The junior horse is only specifically for horses that are three, four or five-years-old. Any horse that is six-years-old and above cannot show in the junior horse class. Those are specifically for young horses that are being seasoned,” Whitehead said. The Non Pro also changes the level of cow work. “In the Non Pro class the cow work changes again, you box it on one end, drive it down the fence turn it on the fence, go back down the fence and turn it on the fence again and bring it back down the fence, circle it one direction and then circle it the other direction,” said Whitehead. The final division is the open. “Then your open is all your trainers, your guys that get paid to do this for a living that get paid to give lessons and to train,” Whitehead said. For more information on the stock horse team you can contact coach Bobbie Walton.